It's about time to debunk this company's unfounded and misleading claims. Don’t you just hate it when some guy comes to you and say: “Hey, we’ve got this new product that can enhance your bio-field and energy vibrations! It has been proven by Japanese/US scientists and passes the Federal standards!” Don’t you? Yet, while sceptics will simply laugh off these pseudoscientific products, many people are unfortunately scammed. This time, I will deal with the great energised water scams so prevalent across the globe, and here’s the leader in Malaysia/Hong Kong – Diamond Energy Water. Let’s look at Diamond's claims. Smaller Water Clusters for Better Absorption by Cells?! So after 30 years of research from Japanese scientists (one must wonder where did the funding come from, and how no one knew of it beforehand), they developed the Energy Conversion technology that breaks water clusters into smaller clusters for easier absorption by body cells, which in turn improves our body’s metabolism and absorption of nutrients and allows for more dissolved oxygen. Sounds quite familiar, eh? Time to debunk the pseudoscience. In true chemistry, water clusters are defined as a hydrogen-bonded cluster of molecules of water. Let me explain what’s a hydrogen bond. 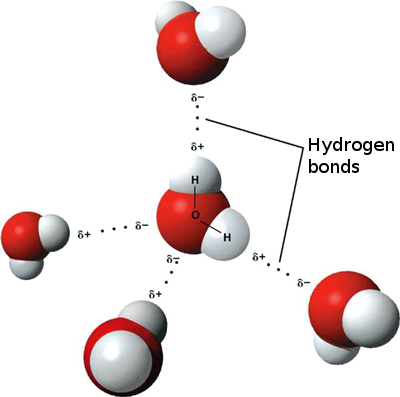 A hydrogen bond is a type of electrostatic interaction between electronegative atoms (fluorine, nitrogen, or oxygen) within a molecule and hydrogen atoms bound to another electronegative molecule. The bond can occur between molecules (intermolecular), or they can occur within the same molecule (intramolecular). Hydrogen bonds are only about 1/10 as strong as normal covalent bonds. A water molecule can be bonded to 4 other molecules at one time. This is because its 2 hydrogen atoms can be bonded to 2 other oxygen atoms, while its oxygen atom can accept up to 2 hydrogen bonds. As a water molecule can bond with the most number of other water molecules at the same time when compared to similar chemicals, it has a relatively high boiling point, melting point and viscosity. Here's what I mean: A water molecule with its hydrogen atoms bonded to 2 other oxygen molecules and its oxygen molecule being bonded by 2 other hydrogen molecules. Let’s assume that the Energy Conversion technology actually works, and it’s perfectly capable of breaking waters clusters down to the smallest possible cluster (that’s a water dimer, which consists of 2 hydrogen-bonded water molecules). But for the technology to really work, the water cluster’s structure must remain unchanged from the moment it passes through the filter to the time it’s absorbed by our cells. That’ll take minutes, at the very least. And, according to these peer-reviewed scientific reports in the “Read More” section below, the lifespan of hydrogen bonds are counted on the scale of picoseconds, or 10-9 seconds. You read that correctly, those who are interested in buying energised water of any sort. The structure of the water clusters would’ve changed innumerable times before you can even flinch. But that’s not the end to Diamond’s claims. They say that they have a far-infrared technology that stabilizes energy within the water to allow the structure to be maintained for a longer period. This claim is without scientific evidence, and it’s not sure what they actually mean by “stabilizing energy”. But even assuming that water clusters can actually be stabilized, can it still maintain its structure during the move from the 4th filter to the 5th filter? Since we’re talking about change within picoseconds here, it’s a no. I’ve made it pretty clear that Diamond’s so-called energy water are full of pseudoscientific bunk. Moreover, Diamond’s act of making false claims about their products is simply unethical, and isn’t justified by the law. Yet, the public is still misinformed on their claims, and it’s still the most famous water filtering company in Malaysia (and perhaps Singapore, Hong Kong, Taiwan). So if you have any Malaysian friends, inform them of this! PMR study of the lifetime of complexes with a strong hydrogen bond at low temperatures. You have such a talent for explaining complex scientific concepts in an accessible and straightforward manner. I hope you find a very wide audience, the world needs this knowledge. It's just terrible that this company is getting away with defrauding its customers. Have you considered printing this out and sending it to whatever agency is in charge? Godlizard: Thanks for the compliments. The great problem is, people will cling on to their beliefs even in the face of powerful contradicting evidence, and it is hard to convince them. On the other hand, I may send the info to the Consumers Society here, but I can't afford to be involved in legal affairs. I don't even have my own income. Sickening how these people can just make up science sounding words and just pull people in. Good debunking of their crap. True, LoneWolf. The public easily buys into anything that sounds vaguely scientific without much skepticalism. It was disappointing to see an article on "Scientific Evidence that Your Name Affects Your Life" or something along that lines in a Chinese weekly newspaper. The evidence was "water memory", a pseudo-scientific concept put forward by the scammer called "Dr." Masaru Emoto. But that was expected, since the newspaper is all about ghosts, feng shui, miracles and other superstitions. Thanks for your good review. You have exposed one of the hocus pocus aspect of Diamond Water System, ie. one of the 6-filter.